WRITTEN BY (c. by Written Tycoon). 4 wins. See below. Take a Selfie (f. by Time Thief). Winner at 1200m in 2016-17, 3d MRC (Mornington) Big Screen Company H.
Il Divo (g. by Dalakhani). 2 wins at 1400m, 1900m in 2017-18 in Aust. Turn Again (g. by Spinning World). Winner at 1400m in Aust. Dubling. Winner at 1300m, 2d BRC Visit Brisbane P.
Yau Chin. Winner. See above. Carnegie Hall. 3 wins at 1400m, 1800m in Aust. Cracker. 2 wins-1 at 2-at 900m, 1150m, Counties RC Home of Motor Racing 2YO H., 2d Matamata RC Rich Hill Stud H., CJC Inglewood Stud Selling at Karaka Select H., Otago RC Aakland H., 3d WRC Wellfield Lodge H., 4th Matamata Breeders' S., Gr.2, CJC Canterbury Belle S., L.
What a Dilemma. Winner at 1400m, 2d Avondale JC Magic Ring Newmarket Lodge Juvenile H.
First Tothelign. 3 wins at 1200m, Singapore TC Dreyfuss S., Graduation S., 3d Singapore TC Benchmark 74 H.
Sharp Decision. Winner at 1200m in NZ. Whitening. Winner at 1200m in Aust. Tilla's Daughter. Winner. See above. Catch Twenty Two. Placed at 2, 2d VRC Maldon 2YO H.
Scottish Laird. 7 wins from 1200m to 1800m, A$81,350, AJC Poplar H., Sadlier H., 3d STC Spring Racing H., Jeff Pendlebury Bookmaker H.
Shot in the Dark. 2 wins at 1400m, 1900m, STC Five Dock H., 2d AJC DD Glasgow H.
Nuke Time - Noble Choice (H.K.). Winner at 2, ARC Deutz Fashions in the Field 2YO H., 2d HKJC ATV News H., Amethyst H., Nam Chung River H., 3d Avondale JC Frank Sing Barristers & Solicitors 2YO H., Waikato RC Esker Lodge Juvenile S., HKJC Shanghai H., Bowring H., Job Preservation & Creation H.
Writ. 2 wins at 1350m, 1850m in Aust. PINS (Snippets). 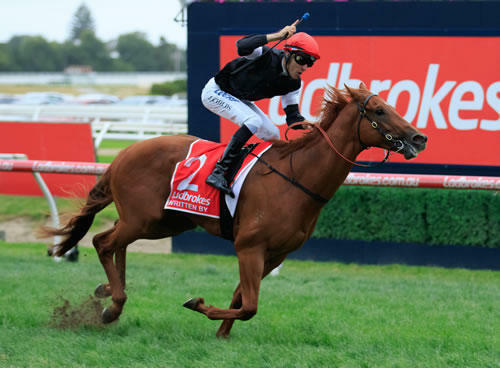 7 wins-1 at 2-from 1100m to 2000m, A$1,733,895, VRC Australian Guineas, Gr.1, AJC Stan Fox S., Gr.2, MVRC Alister Clark S., Gr.2, VATC Autumn Classic, Gr.2, Zeditave S., L, STC Amber Kennedy Memorial P., 2d VRC Debonair S., L, NSW Tatt's RC Ming Dynasty H., L, STC Night Racing 2YO H., 4th Newcastle JC Spring S., Gr.3. Champion sire. NIPS (Snippets). 7 wins to 1500m, A$312,100, STC Shannon H., Gr.2, NSW Tatt's RC Tramway H., Gr.3, STC Swimming Pool & Spa Association H., Illawarra TC Kembla Grange Cup Prelude, 2d City Tatt's RC Emirates H., 3d STC Shannon H., Gr.2, De Bortoli Wines H., 4th VRC Newmarket H., Gr.1, Newcastle JC Newmarket H., Gr.3, STC Royal Parma S., L, MRC JRA Doveton S., L.
GAMESMAN (Eagle Eyed). 5 wins-2 at 2-from 1200m to 1900m, A$213,025, STC Premier's Cup, L, Magic Millions H., Diggers' Restaurant H., Blacktown Workers' Club 2YO H., Cronulla RSL 55 & Over 2YO H.
ROTHKO (Zoffany). Winner at 2, SAJC Fulham Park P., L, 3d VRC Myer Fashion S., L.
Race Record: 5 Starts 4-0-0 A$1,409,000. 4 wins at 2, A$1,409,000, in 2017-18, MRC Blue Diamond S., Gr.1, ATC Pago Pago S., Gr.3, MRC Blue Diamond Prelude (c&g), Gr.3, Cameron Thurley Bucks Day 2YO P., 4th ATC Golden Slipper S., Gr.1.